On Sunday we wound our clocks and watches forward an hour. Why? To enjoy the glorious South Australian sunshine for an extra hour every afternoon. Generally for most of us these longer afternoons mean the increase of pleasant social evening gatherings, the dusting off of the BBQ, and for some of us an afterwork dip in the pool or at the beach. While daylight savings has so much to offer as far as the longer days go, it can also pose quite the hazard for road users. With the improving weather more and more people try to make the most of it. And these people aren’t always the ones behind the wheel. Summer brings with it more cyclists, runners, dogwalkers, and horse riders, than the cooler months and as such the distractions increase. It’s hard enough to deal with the added distractions and obstacles of the longer days, but with the added glare of driving in the twilight these can often become hazardous. While we can’t completely eliminate the glare of the setting sun completely, there are a few easy steps we can take to reduce it, and reduce the likelihood of ending up in an accident. There are obvious things you can do, such as wear sunglasses, and use your window shade, but there are some other super simple steps you can take to ensure you have clear and full vision while driving. A lot of us work in the city, and drive home each day heading East or West. While those of us heading West to go home in the evenings have to stare directly into the setting sun when driving we at least have the advantage of being aware of the huge ball of gas millions of miles away that is trying to blind us and as such wear sunglasses and use our window shade, however those heading away from the setting sun face a different problem; the rear vision mirror. While it’s not common for the sun to be reflected directly into a driver’s eyes for the duration of the trip, it is very common for us to “catch” the sun’s rays in the mirror and have a our attention drawn away from the road for a few seconds. 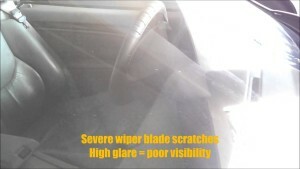 To avoid this happening simply use the little switch on the bottom of the mirror used to avoid headlight glare at night. This will ensure the sun doesn’t blind you unexpectedly while driving home. When we suggest this one to customers that have complained about severe windscreen glare in the past they often raise an eyebrow and ask why. Now obviously with the weather improving for the most part wiper blades are usually low on the priority list, however it was this time last year that those freak hail storms saw us busier than we’ve been in the last decade. While those sorts of storms aren’t likely the condition of your blades can still play a major role in providing clear vision in sunny weather. In the warmer months we often have a lot of dust and dirt on our windows, and without thinking we squirt the windscreen and the wipers wash the dirty water away. With fresh blades (Anything up to 6 months) this simple solution works perfectly and we don’t think twice about it, but for blades older than 6 months we can be contributing to a potential hazard. When we have dirty windscreens, old blades, of not enough water to spray the windscreen with the movement of the blades rubs dirt across the glass and scratches it. In most cases drivers are completely unaware of the damage they are doing until it’s far too late and they have to deal with being nearly completely blind, driving towards the sun at 100km/h. The simple solution: Change your blades and top up your water.